Research on projects and their success have pondered on many dimensions related to the management of projects in various sectors and the resultant outcomes. Project success studies concentrated on management systems in place for projects as well as the benefits realized due to projects and programs. Project success in the perspective of various stakeholders differs from each other and this is largely due to the success criteria each consider while evaluating/ judging the success of projects. This study is a pilot that tries to capture the preferences of workforce related to success criteria for projectsin their respective work areas. This paper draws inspiration from Atkinson's paper titled “Project management: cost time and quality two best guesses and a phenomenon, it's time to accept other success criteria” (Atkinson, 1999) which dwells on the need to adopt additional success criteria for projects than just the major three criteria generally referred as the 'Iron Triangle' – time, cost, quality and eventually puts forward a method called the “square route” with additional considerations towards project success criteria. This paper forms part of the Ph.D. research on success factors in planning of infrastructure projects and is an initial portrayal of the preferences of project professionals in India about success criteria in projects. Project performance over the years is habitually measured in terms of the management factors referred to as “iron triangle” comprising cost, time and quality factors (Atkinson, 1999). Many researchers have pointed out the role and use of these criteria in the management of project execution and also highlighted the cons of using these criteria alone as a means of project success measurement. Hard factors like cost, time, quality are relatively easy to measure. Soft factors like happiness, job satisfaction, enhanced reputation are subtle and difficult to measure. (Baccarini, 1999). Success of project means different things for different people (Shenhar, Dvir, Levy, & Maltz, 2001). Different stakeholders based on their interests/ involvement in the project during particular project phases have their own views on success of the project, Some researchers suggested that project success criteria should be specific to each project and that they should therefore be determined by stakeholders at the start of each project. Critical Success Factors are those components that are necessary to deliver the success criteria and can be described as the set of situations, factors or actions that contribute to the final results or the achievement of success criteria (Gomes & Romão, 2016). Project Success Criteria obtained from literature and authors' own experience in public infrastructure projects formed the basis for choosing the twelve success criteria which were included in the study. An online questionnaire-based survey was conducted, the respondents targeted were employees in their mid-career level for various industry segments with experience above10years in their respective work streams. Convenience sampling was adopted for collection of responses and eventually it was observed that few respondents were having lesser experience. 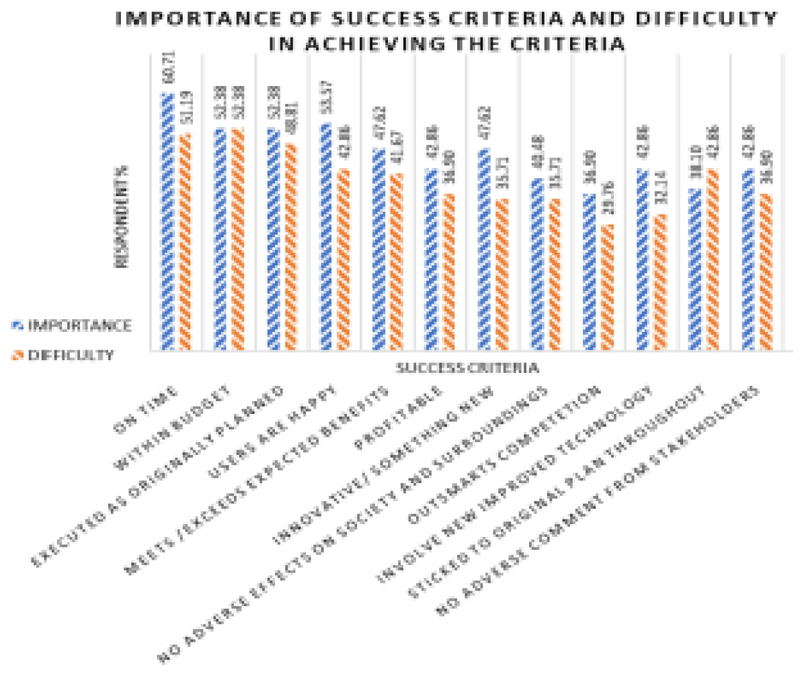 Data on success criteria with respect to the perceived importance and perceived difficulty in achieving the criteria was collected from the respondents and analysis of preferences for success criteria among respondents is included here. Information from respondent profile shows that average age is 40.8 years and average years of experience of 16.5 years. 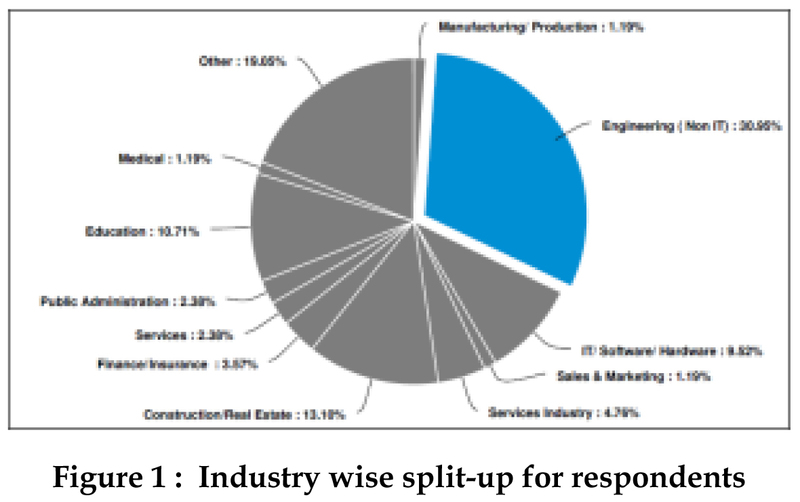 An industry split-up of the respondents is shown in Figure 1 below, the data shows that there are respondents from a minimum of 12 industry sectors of which Engineering (Non IT) sector has the maximum of about 31% respondents. A maximum of 33% respondents have identified themselves as professionals while managers account for 23% and consultants/ advisors 15%. Among them, all managers and consultants have expressed involvement in projects whereas 93% of respondents categorised as professionals involved in projects. Overall, there is 94% involvement in projects. The questionnaire enabled respondents to select their choice of success criteria from the provided list of 12 criteria and also to select those success factors which they feel are more difficult to achieve. In addition, a qualitative rating for the level of importance and level of difficulty for the selected success criteria on a three-point scale was also gathered. As shown inFigure-2 below, it can be seen that on-time completion (61%) is selected as the most important success criteria followed by within budget, execution as planned and user satisfaction (all the three in the range 52%-53%) whereas in terms of difficulty in achievement, both on-time completion and within budget are selected as critical by maximum number of respondents. In addition, other success criteria like user satisfaction, meeting expected benefit and innovation are also given some focus. Figure-2 below shows a plot of the success criteria selection along with perception on the difficulty in achieving success with respect to the particular criteria, it can be observed that the preference towards the success criteria by the respondents and their assessment of difficulty for achievement of the particular criteria shows a similar trend. A relation between the two variables is a possibility based on the available variation pattern. The present study explores the basic preferences on success criteria and therefore is not in a position to comment on this aspect. It is expected that further analysis on the same could throw some light. A comparison on the collected data on a regional basis was carried out. From Table-1 above, we can see that 25% of the respondents are from Kerala (21 Nos), 19% respondents from Bangalore (16 Nos) whereas 12 respondents (14%) from Middle east cities (Dubai, Abudhabi, Doha and Kuwait). 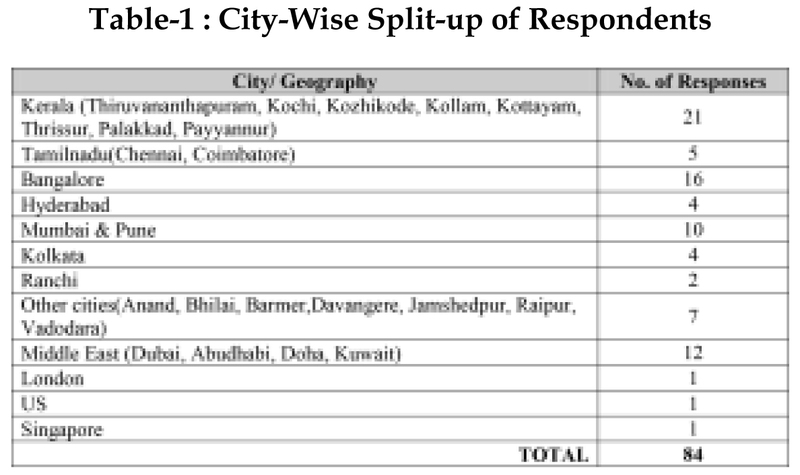 The selection also assumes significance considering that respondents from Kerala are from smaller cities/ towns which could be considered as semi-urban whereas both Bangalore and Middle east cities are categorised as world cities(Sassen, 1991). Table-2 below gives a comparison of the basic respondent characteristics. It could be seen that a comparatively substantial representation from Non IT engineering professionals in the sample considering the total sample as well as regional split-up (> 30 % overall and upto 47% for Kerala). This suggests that the success criteria selection could possibly have a bias towards Engineering (Non IT) projects. The fact that the present study is intended to aid the' research on p r o j e c t s u c c e s s i n i n f r a s t r u c t u r e p r o j e c t planning(Kothandath, 2017)could possibly add another reason for the biased sample. 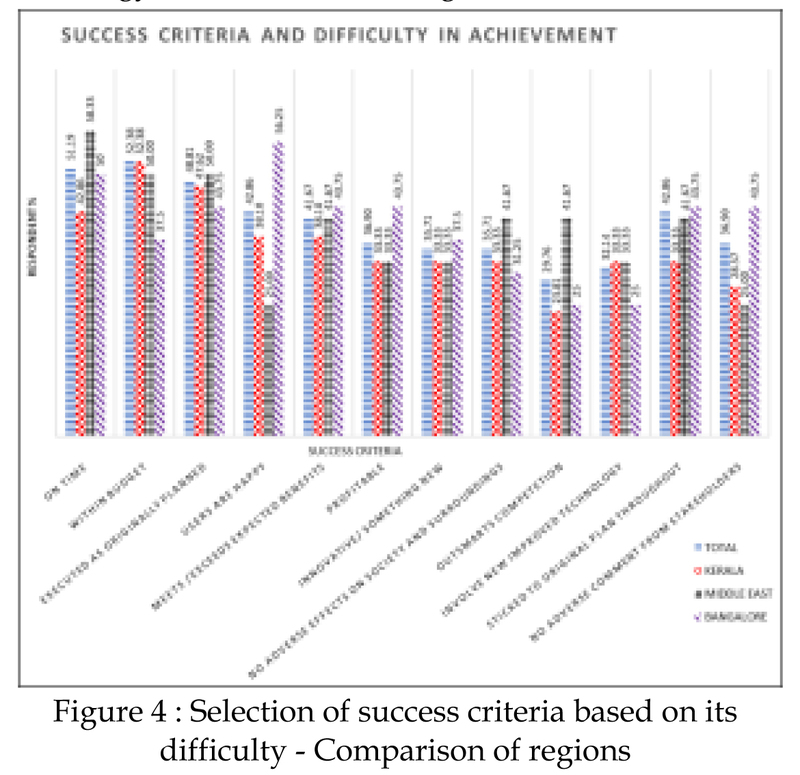 A plot of regional comparison with regards to the selection of success criteria and perceived difficulty in achieving the particular criteria for the four regions in Table 2 is provided in Figure 3 and Figure 4 respectively. 'On time completion' is selected as the most important criteria in all the regions followed mostly by 'within budget' and 'user satisfaction', a general similarity in preferences is found along with some unique preferences. For instance, a clear preference towards 'user satisfaction' and 'new technology' can be found for Bangalore. A comparison of the characteristics and success criteria preferences for the main sector to the other sectors combined was carried out to explore any major visible differences. 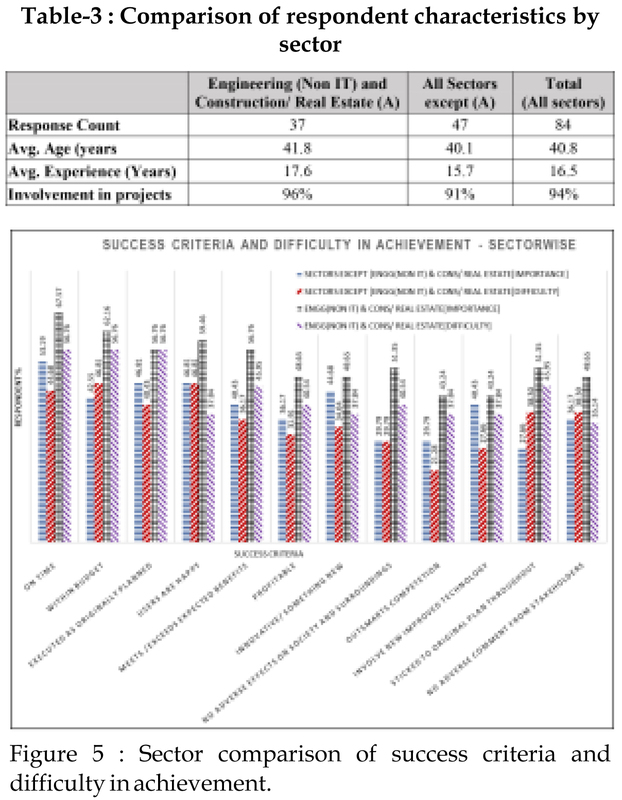 In this analysis, major sector considered is samples from Engineering (Non IT) and Construction/ Real Estate sectors put together with a total of 37 responses. Other sectors combined accounts for the balance 47 responses. Table 3 compares the basic characteristics of the two categories along with the overall data. A total of 84 usable responses received from more than 250 prospective respondents to whom questionnaire posted including 21 from Kerala, 16 from Bangalore, 10 from Mumbai and Pune and 15 from expatriates of which 12 from Middle east. 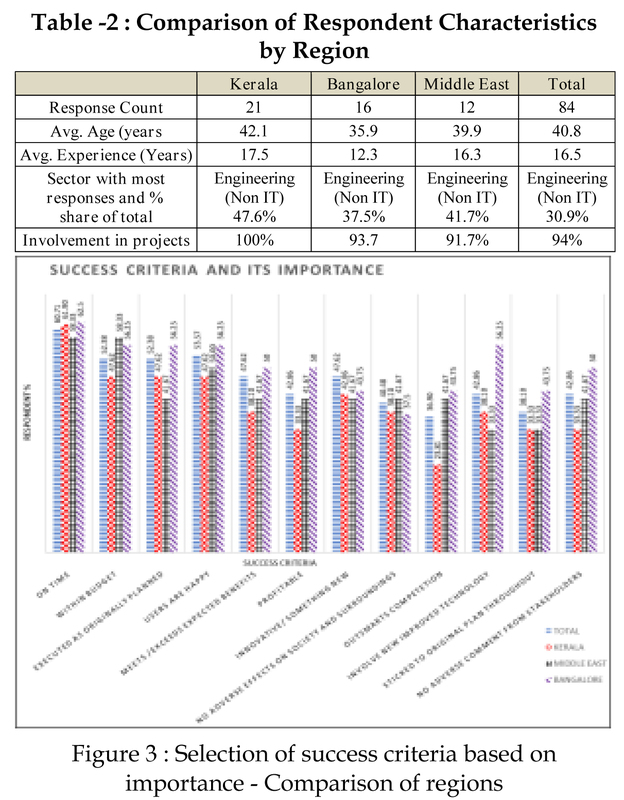 Engineering (Non IT) sector has the maximum of 31% respondents. 33% respondents are professionals, managers are 23% and consultants/ advisors 15%. 94% have expressed project involvement. 'On time completion' is chosen as the most important criteria overall, the same is found true for region wise analysis and sectoral analysis. A general similarity in preferences is found in regional analysis with some unique preferences like preference towards 'user satisfaction' and 'new technology' found for Bangalore. Substantially higher preference for success criteria observed in the major sector in comparison to other sectors combined. Higher preferences to time and budget criteria across sectors and geographies is observed and points to more focus being given to project management process and operational aspects instead of project benefits and success (Shenhar et al., 2001). Sectoral comparison of perception for success criteria is in line with general belief regarding complexity for physical infrastructure projects and its preference for more success criterion. A possible close relation between preference for a success criterion and its perceived difficulty to achieve is found, the present analysis not sufficient to confirm the same and hence further analysis needed on this aspect. Baccarini, D. (1999). The Logical Framework Method for Defining Project Success. Project Management Journal, Volume 30(Issue 4), 25–32. https://doi.org/10.1086/ 250095. Baker, B. N., Fischer, D., & Murphy, D. C. (1974). Multiple Determinants of Project Success and Failure. Boynton, A. C., & Zmud, R. W. (1986). An Assessment of Critical Success Factors. Sloan Management Review, 25, 17–27. Cooke-Davies, T. (2002). The “real” success factors on projects. International Journal of Project Management, 20(3), 185–190. https://doi.org/10.1016/S0263- 7863(01)00067-9.
de Wit, A. (1988). Measurement of project success. International Journal of Project Management, 6(3), 164–170. https://doi.org/10.1016/0263-9. Jajac, N., Knezic, S., & Marovic, I. (2009). Decision support system to urban infrastructure maintenance management. Organization, Technology and Management in Construction, 1(2), 72–79. Koops, L., Coman, L., Bosch-Rekveldt, M., Hertogh, M., & Bakker, H. (2015). Public Perspectives on Project Success – Influenced by National Culture? Procedia - Social and Behavioral Sciences, 194(July), 115–124. https://doi.org/10.1016/j.sbspro.2015.06.126. Kothandath, S. (2017). Success Factors in Planning of Infrastructure Projects and associated risks: A study of user perception. IUJ Journal of Management, Vol 5(1), 34–38. https://doi.org/10.15713/ins.mmj.3. Munns, A. K., & Bjeirmi, B. F. (1996). The role of project management in achieving project success. International Journal of Project Management, 14(2), 81–87. https://doi.org/http://dx.doi.org/10.1016/0263- 7863(95)00057-7. Pinto, J. K., & Slevin, D. P. (1988). Project success: Definition and Measurement Techniques. Project Management Journal, 19(3), 67–73. Sassen, S. (1991). Global City, (1997), 113–114. Shenhar, A. J., Dvir, D., Levy, O., & Maltz, A. C. (2001). Project success: A multidimensional strategic concept. L o n g R a n g e P l a n n i n g , 3 4 ( 6 ) , 6 9 9 – 7 2 5 . https://doi.org/10.1016/S0024-6301(01)00097-8.